The Music of Cream was presented to an attentive audience at the City Winery in Nashville, Tennessee on April 07, 2019 proving that this creative, rich music is still fresh in the age of the Internet. The Music of Cream is Will Johns, Malcolm Bruce and Kofi Baker. The original Cream was a British rock power trio formed in 1966 - consisting of drummer Ginger Baker, lead singer/bassist Jack Bruce and guitarist/vocalist Eric Clapton. Although they disbanded in 1969 the group left a powerful legacy. They sold millions of records world-wide with songs that ranged from traditional blues to psychedelic pageantry. Cream is credited with paving the way for other technically proficient musicians and styles to follow. The trio was inducted into the Rock and Roll Hall of Fame in 1993 and they were included in both Rolling Stone and VH1's lists of the "100 Greatest Artists of All Time". Today, the pedigree of Cream are presenting a multi-media concert experience to modern audiences. Kofi BAKER (son of Ginger) and Malcolm BRUCE (son of Jack) unite with Will JOHNS (Eric's nephew by marriage and son of Zeppelin/ Stones/ Hendrix engineer Andy) to unleash the lightning that electrified an era. In a live setting they played the music of the original super-group interspersed with videos and some sharing of their own personal insights and stories. The expression goes that the apple does not fall far from the tree. 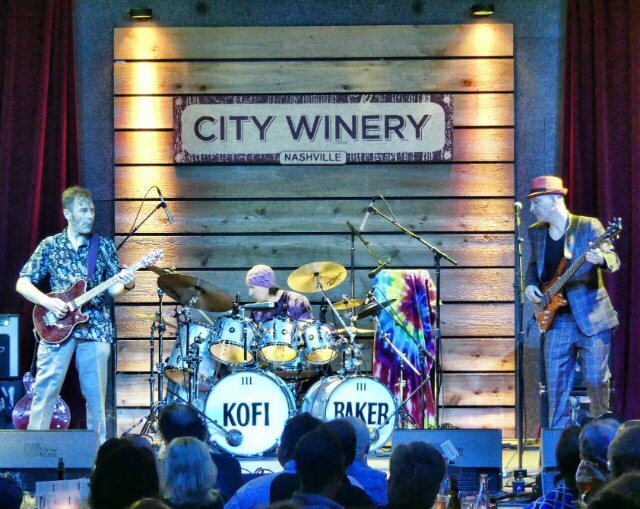 Kofi Baker's first performance was with his father, jazz-rock legend Ginger Baker, on live TV at the age of six. Since then he has pounded the skins for Tom Jones, Jack Bruce, Steve Marriott and more along with being a part of the Extreme Guitar Tour. Malcolm Bruce grew up in rock royalty and via the Guildhall School of Music he began performing professionally at 16. As bassist, engineer, guitarist or pianist Malcolm has worked with his father, Little Richard, Elton John, Eric Clapton, Dr John and more. Also coming from a musical lineage and by several curious twists of the family tree, Will Johns counts "Slowhand", George Harrison, Mick Fleetwood and the great rock producer Glyn Johns as uncles. With three solo albums to his credit Will has also worked with Joe Strummer, Ronnie Wood, Jack Bruce and Bill Wyman. A few minutes before show time incense were lit. In addition to scent, The Music of Cream relied on art, classic footage and videos to enhance the 60's vibe of their concert. Malcolm and Will in the roles of lead vocalists did not sound exactly like their counter-parts but they certainly brought the improvisational spirit to the classic catalogue. Kofi was potent often propelling the trio's energized jams which were a big part of the show allowing them all to put their own flavor on the covers and originals that Cream was so well-known for. "We are very glad to be here," declared Bruce after someone yelled out "I'm So Glad" which they would open the second half with. In the meantime, Malcolm mentioned that his Mum penned some of the band's songs - a fact that we did not know. When Kofi chatted to the crowd he alluded that there were a lot of drugs around and that the walls in his childhood home were all different colors. Baker took the lead on "Pressed Rat and Wart Hog" a song his father had composed for Cream. The trio expanded the strange story with a jaunty jam. Johns shared that when he was a kid he would sometimes visit his Uncle Eric who had a home studio. Young Will - an early riser would make his way to the music room to pound away at the drums. Clapton awoken by the prot�g�e told his nephew its time you play a proper instrument and showed him a few things on the guitar but EC told Johns he had to learn "Cross Road Blues" himself. Will and company proved that they all had learned the Robert Johnson classic well-complete with a soaring guitar solo. Malcom mused that it's hard to believe that this song is from 1926 before the band went real old school blues with "Sitting On Top of the World". 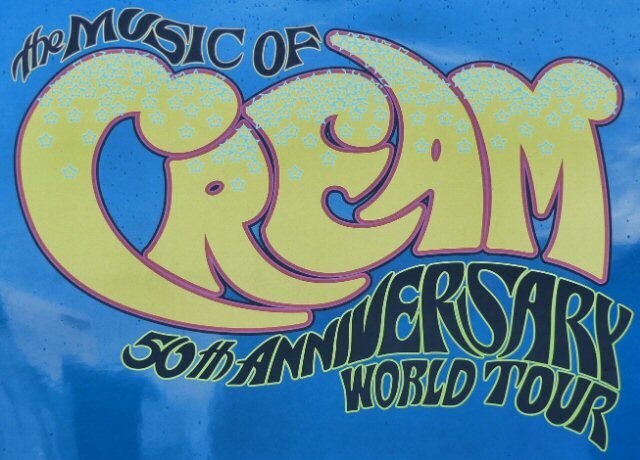 The Music of Cream paid an electrified tribute to their heritage with a set-list packed with fan favorites such as the still so true "Politician", "Strange Brew", a swirling "SWLARB", "Sunshine of Your Love" and many more. During the concert Malcom said they enjoyed playing this music so much. That enthusiasm showed and it's likely that if you go to see The Music of Cream that each time they approach the catalogue it will be different just as it was back in the 1960's - so check out this lineage line-up for yourself and enjoy a fresh take on the legacy of Cream. 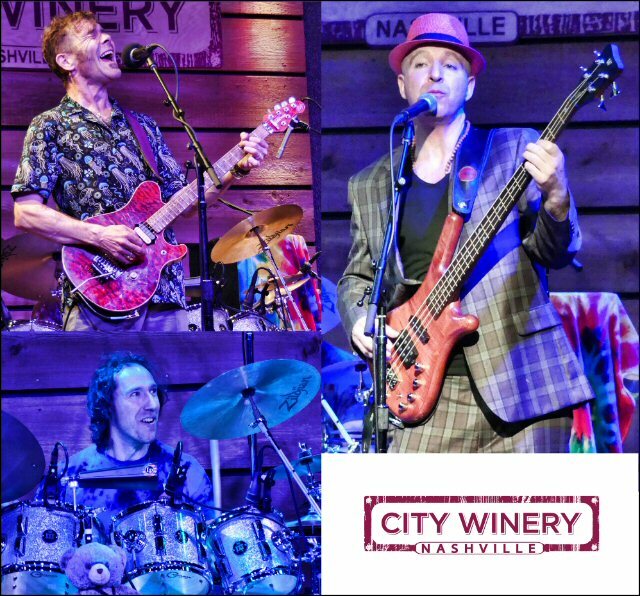 The City Winery Nashville located at 609 Lafayette Street is not only a venue showcasing acts such as The Music of Cream but they "strives to deliver the highest-end combined culinary and cultural experience to customers. They are a unique facility, featuring a fully functioning winery with intimate concerts, food & wine classes, private events in a variety of configurations, and fine dining." Upcoming shows at the City Winery include Joan Osborne, Shelby Lane, Jon B, TN Jazz & Blues Society, Victor Wooten Band, Queen of Beatniks and more. The Music of Cream was recreated at Nashville's City Winery.